This MFAP5 antibody is generated from rabbits immunized with a KLH conjugated synthetic peptide between 133-160 amino acids from the C-terminal region of human MFAP5. May play a role in hematopoiesis. In the cardiovascular system, could regulate growth factors or participate in cell signaling in maintaining large vessel integrity (By similarity). Component of the elastin-associated microfibrils (PubMed:8557636). Small volumes of anti-MFAP5 antibody vial(s) may occasionally become entrapped in the seal of the product vial during shipment and storage. If necessary, briefly centrifuge the vial on a tabletop centrifuge to dislodge any liquid in the container`s cap. Certain products may require to ship with dry ice and additional dry ice fee may apply. MFAP5 is a 25-kD microfibril-associated glycoprotein which is rich in serine and threonine residues. The protein lacks a hydrophobic carboxyl terminus and proline-, glutamine-, and tyrosine-rich regions, which are characteristics of a related 31-kDa microfibril-associated glycoprotein (MFAP2). The close similarity between these two proteins is confined to a central region of 60 aa where precise alignment of 7 cysteine residues occurs. The structural differences suggest that this protein has some functions that are distinct from those of MFAP2. Western blot analysis of MFAP5 antibody (C-term) in K562 cell line lysates (35ug/lane). MFAP5 (arrow) was detected using the purified Pab. 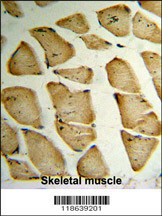 Formalin-fixed and paraffin-embedded human Skeletal muscle reacted with MFAP5 Antibody (C-term), which was peroxidase-conjugated to the secondary antibody, followed by DAB staining. This data demonstrates the use of this antibody for immunohistochemistry; clinical relevance has not been evaluated. 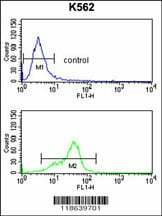 MFAP5 Antibody (C-term) flow cytometry analysis of K562 cells (bottom histogram) compared to a negative control cell (top histogram).FITC-conjugated goat-anti-rabbit secondary antibodies were used for the analysis. Western blot analysis of MFAP5 (arrow) using rabbit polyclonal MFAP5 Antibody (C-term). 293 cell lysates (2 ug/lane) either nontransfected (Lane 1) or transiently transfected (Lane 2) with the MFAP5 gene. NCBI/Uniprot data below describe general gene information for MFAP5. It may not necessarily be applicable to this product. MFAP5: Component of the elastin-associated microfibrils. Belongs to the MFAP family. 1. Alteration of MAGP-2, a component of microfibrils and elastic fibers, appears as an initiating mechanism of inherited Thoracic aortic aneurysm and dissection (TAAD).